Boys play football in the yard of the school in Les Cayes, Department du Sud, Haiti, which is being used as a living space or shelter for several hundred people who have lost their homes to Hurricane Matthew. 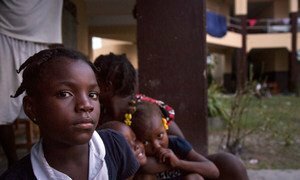 The United Nations fund aimed at rapid humanitarian response for people affected by natural disasters and armed conflict has approved $3.5 million for restoring safe education services for schools and other relief activities in storm-hit southwest Haiti. According to the situation report from the UN Office for the Coordination of Humanitarian Affairs (OCHA), the disbursement from the Central Emergency Response Fund (CERF) will also cover protection assistance to most vulnerable people evicted from temporary shelters and support to an estimated 30,000 people in areas of return. While the Caribbean island nation recovers from the massive destruction wrought by Hurricane Matthew nearly three months ago, the UN Children’s Fund (UNICEF) and partners have identified 1,633 schools in need of repairs, affecting approximately 190,000 children, according to the report. With the funding, the UNICEF-led education project will be implemented in the municipalities of Les Cayes, Port Salut, and Jeremie, among others. The project will target some 16,000 children between age six and 18, who have been excluded from school as a result of damages caused by the Hurricane. In the storm’s wake, schools served as temporary shelters for evacuees, UNICEF said. Schools in these municipalities are now being vacated and will provide the minimum required conditions for the resumption of teaching and learning activities. Children will also benefit from protection assistance and receive school kits, while schools are cleaned, refurbished and basic WASH (water, sanitation and hygiene) facilities are rehabilitated. In Haiti’s Sud region, UNICEF worked with partners to ensure that 30 schools, previously used as shelters, now have adequate sanitation for their reopening. As of November, 62 per cent of the Flash Appeal – the international community’s effort to adequately help the Haitian Government meet the critical needs of its people – has been funded. The gap remains at $52.5 million, according to OCHA.